How close is “too close”? Not long ago I attended an annual local event in which numerous people from the horse world present themselves to the public with the intent of educating them. The presenters are of mixed, and sometimes dubious, background and expertise. I rarely attend the event, as it is strongly skewed toward the Western riding disciplines, with only a token English rider here or there. This year I was on the hunt for a tractor, so it seemed an opportunity to see if the event had made any significant improvements since my last attendance (hint: it has not). 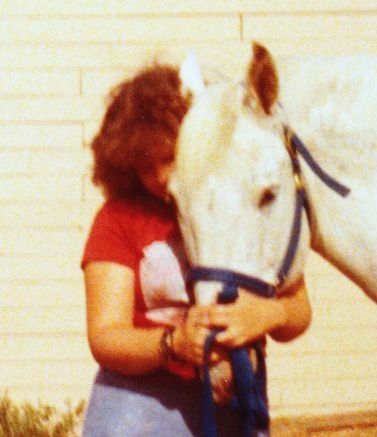 I’m a horse hugger from way back … here with my first horse, Wicki, in a clinch. intrigued by how some of the impressive training is accomplished. Sadly, this session was not about liberty work after all, but was a tired rehash of every “round pen reasoning” (or choose your favorite term for it) session that I have ever seen. However, early in her work, the young woman said something that I have been chewing over ever since: that the biggest mistake we make today is to let our horses get too close to us. Her follow up explanation and work made it clear that she meant physically too close. I was left wondering, just how close is too close? And what are the ills that come of it? As with all training advice I encounter, I measured these questions against my experience over these many decades to see if I could find the grain of truth. You see, no matter how I feel about the advice, I can always find some root cause for how the person arrived at it. So, I pondered whether I’d encountered any difficulties whose root could be attributed to letting a horse get “too close” – and I could find none. Oh, it’s true that I’ve been stepped on, shouldered, head-butted and nearly run down … more than once! But those were not about a horse being too close, but rather about HOW they got there. Tally was born preferring “up close and personal”. As humans, and particularly in the USA , we tend to have a thing about personal space. I laugh at lines where everyone is keeping several feet away from the next person, for no reason other than this societal concept we’ve created. I will confess to having little issue with personal space – and absolutely no personal boundaries when the other party is equine. Ever since I first made friends with these large animals, I have leaned on, crawled under and wrapped myself around their various parts. I have rewarded their patience with this treatment by putting few limits on their nosing, rubbing and snuggling with me. In spite of what a typical “natural” horsemanship trainer will tell you, horses have no real concept of personal space – they often engage in full-body contact, whether in play or in affection. However, just as with most of us, horses will have times when they want to be alone. For that they put out physical signals, just as you might when “Aunt Martha” tries to kiss your cheek! So, the real problem is not that we let our horses get too close – after all, we expect them to carry us around, allow us to touch them all over their bodies, and even tolerate hands inserted into orifices at both ends. It doesn’t get much closer than that! So why shouldn’t they be allowed to stand close, or put their face against you? Getting “too close” only becomes a problem if you do not provide a commonly understood set of signals that indicate when you need space. All great relationships are founded upon clear communication – even your best friends didn’t just “know” what you wanted in the early days of your friendship! These simple commands provide all that I need to let them know when “close” might not be an option. The rest of the time we can snuggle, lean, hug, nuzzle and be as close as we want to be! I believe that the presenter in question would not actually disagree with my assessment – but I hate to think of how many people went home and put their horses at arms length (or worse, mimicked her techniques) all in the name of not letting their horse “get too close”. 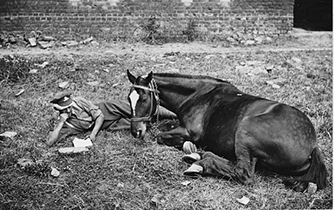 Since this week marks the anniversary of the start of World War I, a conflict in which a tremendous amount of human and equine life was lost, I leave you with this last image of an artillery driver and his horse. Would anyone dare to say that they were “too close”?! Be good to your horses … and give them hugs for me! 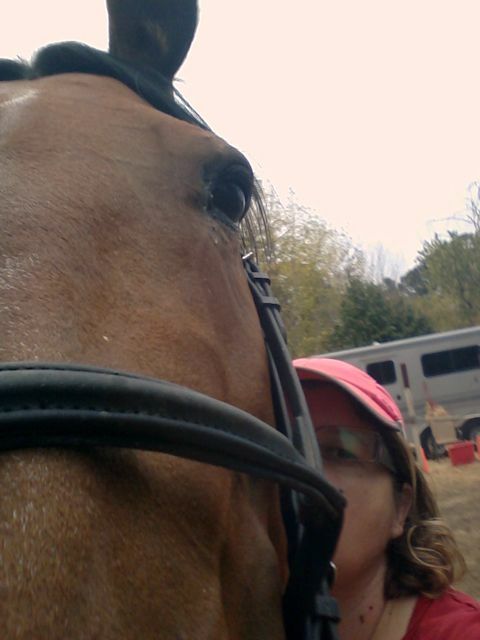 This entry was posted in Horsemanship and tagged affection, Horse training, too close. Bookmark the permalink.